In his remarks about Iran, he juxtaposed the two major agreements between the U.S. and nuclear threshold countries from the last decade: Libya and North Korea in 2003 and 2007, respectively. The agreement with Libya stipulated that the country completely dismantle its nuclear weapons factories and infrastructure whereas the agreement with North Korea simply called for the country to freeze its nuclear activity. In other words, Steinitz articulated, North Korea was allowed to keep its factories and did not need to dismantle any aspect of its program so long as it ceased activity. Today, looking back, Libya does not have nuclear weapons and yet, North Korea, he said, has about 10 atomic bombs. On the flip side, it is possible to compel the Iranians to make the right choice by presenting a dichotomy between sustaining (indeed saving) their economy versus obtaining nuclear weapons. “They’ll make the right choice,” Stieinitz told the audience. Notably, he made the important distinction between nuclear power and nuclear weapons: they can have civilian nuclear power for energy and medical purposes, but that doesn’t require even a single centrifuge for uranium enrichment. Put differently, a good deal means Iran can have nuclear power but without heavy water reactors or underground secret facilities. Israel prefers a diplomatic solution with Iran provided it will be a comprehensive and trustworthy solution that puts Iran years – not days or weeks or months – away from getting the bomb. 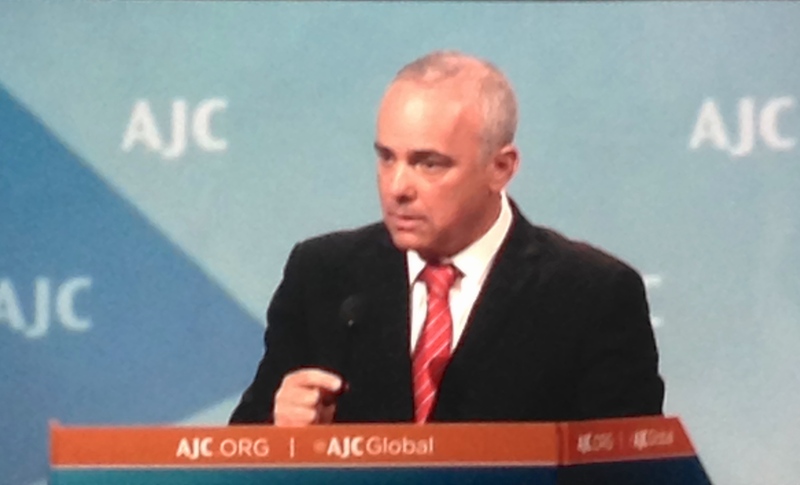 About the peace process, Steinitz underlined the need for a real and genuine peace, and that anything less just don’t cut it. Clinton also reviewed the interim deal with Iran and touched on the peace process between Israel and the Palestinians. Paraphrasing her remarks: Regardless of whether a deal is reached over nuclear weapons with Iran, its state support for international terrorism remains an enormous threat. Finally, Stephens summed up an important point that sometimes gets lost amid all the chatter on this topic: Regarding Iran, we’re not trying to win an argument … We’re trying to stop a tyrannical regime from getting nuclear weapons. All in all, these two conferences were excellently put together and provided a terrific forum to explore some of the most pressing and intriguing topics facing the Jewish people in the U.S., Israel, and around the world. Shimon Peres used to say that Israel is the land of milk and honey but not of oil and money. That is changing! Human creativity is just one of the major reasons to be optimistic about Israel’s future. Israel is the world’s top producer of conceptual products, holds more patents per capita than any other country, and its citizens author more scientific papers (1 per every 10,000 people) than any other nation. 66 years after its independence, Israel reached self-sufficiency with water production: it is now producing 60% of drinking water and is on its way to being a water exporter. 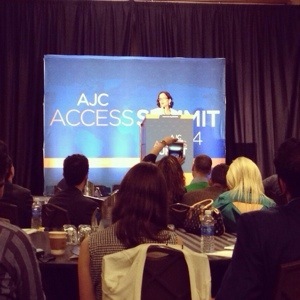 Ours is the first generation of Diaspora Jews who see Israel through the prism of opportunity rather than problems. 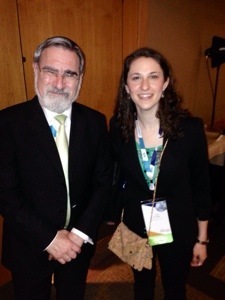 Rabbi Sacks spoke about global anti-Semitism and issued a call to action for our generation. This year, for the first time since Abraham Lincoln declared the celebration of Thanksgiving in 1863, the first day of Hanukkah coincides with Thanksgiving on Thursday, November 28. Because the Jewish calendar is (mostly) lunar and the Gregorian calendar is solar, the two holidays will not coincide for another 77,798 years. In honor of the festival of lights, I’ve prepared a playlist of some of my favorite Hanukkah-themed tunes. By the time the next “Thanksgivikkah” rolls around, I’m perhaps there will be Thanksgivikkah-themed playlists floating around. Each song has a YouTube video linked. I recently heard Gadi Taub’s satisfyingly honest perspective about the State of Israel and the Jewish People’s story in modernity. The Hebrew University public policy professor and novelist – who looks like a sabra rock star poet (then again, aren’t they all?) 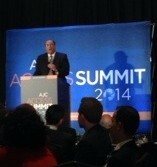 – spoke about the need for Israelis to get back to the roots of Zionism ultimately for the sake of self-preservation. He ended his engrossing history of ideas with a projection of the future of the relationship between Palestinians and Israel, in effect presaging an end to the decades old conflict between Israelis and Palestinians: “We need another partition,” Gadi said. History repeats itself, I thought, envisioning the halls of the United Nations in November 1947. I, like Gadi, consider myself a political centrist and know that Israel needs to draw a line, and soon. There are already red lines and a green line; but this prolific Israeli’s message was that Israel needs to – unilaterally if/when necessary – end the talking and stalling and political posturing by taking a decisive, inherently risky move about its future with whatever Palestinian entity will live in part of what is now the West Bank and/or the Gaza Strip. His talk crystallized for me that Israel needs to change its relationship drastically with the Palestinians (excluding those under Hamas rule in Gaza): from a deeply dysfunctional bond to one more akin to allied yet separate and distinctly independent cousins. Cousins may be close or distant, in touch every week or speak once every five years at the big family reunion, yet they have and always will be related. They share a similar heritage, usually a language (or more), certainly memories; but, as they age, cousins grow up and to the degree that is necessary to be individuals, apart. The latest round of talks have come to a standstill and the ever-unfolding tragedy in Syria gets more coverage than dissipating roundabout talks between cousins near Jerusalem. Iran, too, is routinely – directly or indirectly through Syria and global terrorist plots – in the news more than “the” peace process. The reasons for stalemate could easily populate the length of the next month of your to-do list pad. And yet, there is always an opportunity even in the most seemingly hopeless scenarios. In Greek mythology, Caerus (Καιρός) is the personification opportunity. He was god of the “fleeting moment” when occasions appear and disappear. Journalist: How was life for you in Russia? Journalist: Did you like your job there? Journalist: How was the school system for your children? Journalist: So, you were happy in Russia? Journalist: Well, if you couldn’t complain then why did you move to Israel? Russian: Because here I can complain! 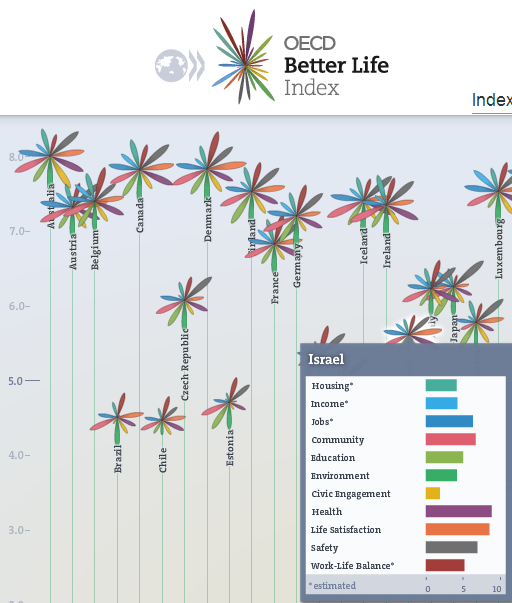 In the last two years, the United Nations’ inaugural World Happiness Report and the Organization for Economic Cooperation and Development ranked Israel in the top 15 happiest countries. The UN report ranked Israel at 14th place and according to the OECD, Israel is the 8th happiest nation on the planet. Considering other factors that typically correlate positively with national happiness rankings, this positive data is somewhat surprising. I remember the first time I traveled to Israel, for six weeks during the summer of 2005 on an artsy program for American and Israeli teenagers called Nesiya. I remember being flabbergasted by the zest for life I encountered among my Israeli peers. They were all relatively close to graduating from high school and heading off to serve in various branches of the Israel Defense Forces. If I were in that position, I thought at the time, I would not be as happy. But they joked, sang, laughed, cried, hiked – did everything the Americans on the trip did, but there was a unique fervor that my new friends exhibited. It was contagious. We traveled the country – hiking through the ravines in the Galilee, swimming in the oases like Ein Gedi south of the Dead Sea, climbing around the Ramon crater in the Negev desert, and exploring the cosmopolitan areas of Tel Aviv and the historic holy sites of Jerusalem. It was exhilarating. One would think that with all the negativity in its neighborhood including the daily threats of terror and destruction, de-legitimization campaigns around the world – to name just a few of the realities of life in Israel – that Israelis would be less than ecstatic with life. In spite of everything, though, Israelis are by and large content. Everything is relative, even on the scale of national happiness. Last night I finished reading a fantastic non-fiction book by my former internship coordinator at the Shalem Center and one of the most thoughtful and insightful writers about Israel out there today. Daniel Gordis’ The Promise of Israel, published last August, is highly accessible and eye-opening. It lends a fresh perspective on the universalism vs. particularism debate, an argument from time immemorial that is imbued with significance through this excellent guide. Using sources stretching from the the Tower of Babel biblical tale to contemporary scholarly debates between figures in the fields of sociology, history, and politics, Gordis skillfully paints the picture of the continued need for the nation-state. Through this masterful account of a very old conversation, Gordis sheds light on relevant discussions and paves the way for a new conversation centered on the endangered idea and reality of the nation-state and all that it encompasses. By exploring issues of identity, community, history, memory through the story of the Jewish State, he illustrates that Israel represents a model for other disenfranchised groups of people, not least of all the Palestinians. Examples abound and demonstrate the many benefits of particularism when it comes to statehood, as opposed to universalist experiments such as the Soviet Union and the more recent invention of the European Union. The history of two languages tell the same story: Ludwig Zamenhof created Esperanto, meant to be a new universal language that heralded a new society along the lines of Immanuel Kant. In contrast, Eliezer Perlman (who later changed his name to Ben Yehuda, “son of Judah”) modernized ancient Hebrew into a vibrant language that today has more than five million more native speakers than Esperanto. The history of these two tongues embodies the ongoing debate between, as Gordis writes, “those who assert that the nation-state is key to human flourishing and those who see [it] as a source of great evil … ” (p. 61) He rightly points out that the debate is often centered on Israel. A worryingly and increasing group of people worldwide are trying to erode Israel’s legitimacy by eroding the idea of the ethnic nation-state that underlies it. These individuals attempt to group Israel, the Zionist project, into the pile with failed enterprises like apartheid and communism. Precisely because of this popular trend, those who care about the continued prosperity of the Jewish State need to renew the discussion. Talk about the relationship between the nation-state and human diversity, which leads to that between the nation-state and human freedom, Gordis writes (p. 71). Finishing the book left me inspired and equipped with the new knowledge I had gained. But also with a sense of urgency because Gordis talks about Israel potentially not existing 50 years from now if wave of Israel detractors continues and grows stronger. To ebb this flow of anti-Israel animus, supporters of Israel – of all ages, faiths, races, and nationalities – need to shift the debate from Israel to the nation-state in all that it represents. Finally, Gordis’ book was touching. The sense of a heartfelt personal relationship of the writer to Israel and all it represents really comes across in The Promise of Israel, especially in the part I found most moving. Towards the beginning of the book he talks about the esprit de corps he experienced while sitting in traffic listening to the radio reporter read the letter that the parents of Gilad Shalit wrote to their teenage son, not knowing whether he would ever read it. (Shalit is the Israel Defense Forces soldier whom Hamas took captive in a deadly assault on his troop in June 2006, who returned to Israel in October 2011 and has since begun reintegrating himself into Israeli society.) The entire country was waiting for the boy to return home, and Gordis looked to either side of his car and saw his fellow Israelis also wipe tears from their eyes. Reading that passage brought a tear down my cheek as well, and as I waited for the train to arrive, I knew that what I felt was more than a sense of empathy from reading an emotional paragraph in a book. I, too, felt that sense of human belonging – in my case to the Jewish People, that universal sense of belonging that is yet another reason on the long list of why particularism in the form of nation-states makes so much sense. On top of being a terrific overview of this age-old debate, this book is a must-read for anyone concerned about Israel’s prosperity in the modern world and the values, peoples, and history it stands for, and the future of the nation-state for all the potential it holds for other peoples the world over. After the tragedy of Monday’s bombings near the finish line of the 117th Boston Marathon, I am reminded of what Winston Churchill said: “If you’re going through hell, keep going.” In the depths of the sorrow and chaos wrought on the celebration of athletic prowess where thousands of athletes and their supporters gathered, it is difficult but necessary to remain steadfast in the quest to continue living our daily lives. Fear, as security expert and author Bruce Schneier wrote in The Atlantic, plays into the hands of the perpetrators. Once it became chillingly clear that the explosions were the work of terrorists, my thoughts immediately turned to the global threat of indiscriminate violence that rages on in city centers from war-torn Iraq, Afghanistan, and Syria, to places where terror has struck in recent years: Tel Aviv, Mumbai, London, and now Boston. debilitate, and wreak havoc, these trying moments are stark reminders of the need to trek on, no matter what challenges lie in the road ahead. I am reminded of what Frank Sinatra said: “The best revenge is massive success.” The method to beat the deep-seated hatred that fuels people to commit terrible actions like Monday’s is to keep going, just like Churchill said. His words ring strikingly true especially on dark days like yesterday. After the horror struck, strangers in Boston showed incredible kindness toward one another. That is a surefire way to begin winning the battle against those who want to maim and kill. A marathon is really an apt metaphor for life; and Monday’s attacks represent a severely unfortunate interruption of what should have been a festive occasion through and through. Let us channel the anger, frustration, and immense sense of loss – both of the precious and innocent lives lost and those disrupted, and the temporary loss of safety – into support for each other. A solid example of admirable camaraderie is the Google doc that Boston.com set up in the aftermath of the attack for people in need of a place to stay or those who have space to offer others unable to get back to their hotels or fly out of Boston. President Obama’s resounding first address to the nation just hours after the attacks was a shining reminder of the character of these United States. “[Marathon Monday is] a day that celebrates the free and fiercely independent spirit that this great American city of Boston has reflected from the earliest days of our nation. And it’s a day that draws the world to Boston’s streets in a spirit of friendly competition.” Acts of senseless violence might test our patience and cause us to grieve, but they will not break our spirit. 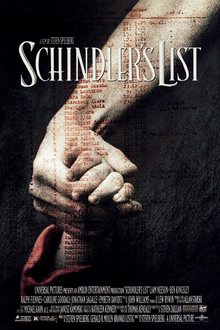 I recently watched Schindler’s List, Steven Spielberg’s 1993 award-winning movie about Oskar Schindler, the Catholic, ethnic German born in what is today the Czech Republic. Schindler, a Nazi Party member, continually bribed SS officials in order to make a profit by employing Jewish Poles in a factory producing metal parts that the Germans could utilize for the war effort. The true story took place in and outside of Kraków Ghetto. The film depicts the madness of SS Lieutenant Amon Goeth, who oversaw construction of the Płaszów concentration camp. 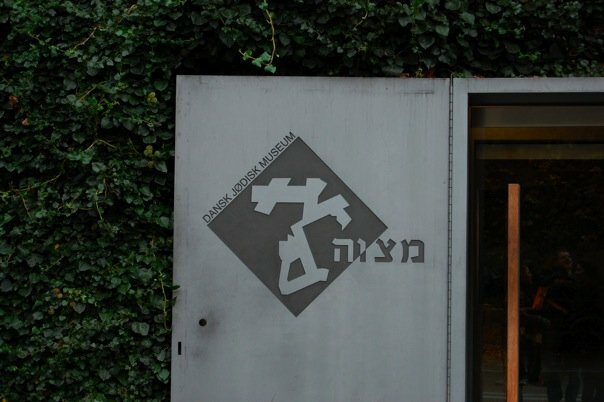 The list of over 1,100 Jewish people whom Schindler managed to save from extermination at Auschwitz can be found at Yad Vashem’s website here. The story reminds the world of the goodness of random strangers who found it in themselves to risk their own lives to save those persecuted Jewish residents of their neighborhoods in Nazi-occupied countries. The Righteous among the Nations, as they are now called, include the names of dozens of individuals like Raoul Wallenberg (Sweden) and groups of people such as the Danes who saved 95% of Denmark’s Jewish population in a miraculous boat trip across the Øresund Strait to neighboring Sweden. And tell the world never again. In fact, today ought to be a wake-up call for the world, including those European countries whose Jews lost their property and many of them, their very lives during the Shoah, to take care of the rapidly-aging survivor population. Many are sadly living in poverty, in need of medical treatment and interaction with others. Last week, the Israeli government pledged at least 50 million shekels ($14 million) to care for this elderly population living in Israel, who have served in many of Israel’s wars over the years after WWII. Let today remind us of the importance not only of caring for our elders, those who kept the flame of the Jewish people’s history and faith alive during that dark period of human history. May their memories be for a blessing. A reminder of the work that still needs to be done are the number of genocidal regimes that have committed sweeping murders of their own and other peoples since the Allies liberated the concentration camps in April of 1945. In the last 30 years alone: the former Yugoslavia in the 1990s; Rwanda in 1994; the ongoing Darfur genocide that began in the early 2000s; and the Syrian authorities’ massacre of its own population that started in 2011 ago and has already claimed the lives of 70,000 and displaced millions of others. Today can be a wake-up call to educate the world of the potential extent of hatred, so that “never again” finally becomes a reality, not just a dream. *I much prefer the term “Shoah” rather than “Holocaust” because Shoah in Hebrew means catastrophe; Holocaust comes from the Greek word for sacrifice. The Nazi genocide of the more than six million Jewish people (and over five million others deemed unfit for life by the Nazi ideology) was not a sacrifice; rather, it was the singling out, humiliation, torture, murder, and attempted annihilation of the entire Jewish population of Europe (and those millions of others). That is an important and necessary distinction and underlines the significance of the words we choose to use. Economic woes lead people to search for scapegoats. This fact, to which history has borne witness time and again, is happening again, much like it did in the years after the Great Depression. There are two sides to this coin: when economic troubles hit a country, people tend to designate a particular group of people as responsible for the downturn. Such an act displaces the burden from the national identity onto an outside (or merely portrayed as an outside) group. That group, as happened in Nazi Germany during the late 1920s and then across Europe, is the Jews, and the blame game is happening across the continent yet again. In places like traditionally homogeneous and historically tolerant Scandinavia, Jewish communities are experiencing unprecedented levels of hatred. Similarly, French Jews have seen an astonishing increase of fifty-eight percent in 2012 over the previous year. In Denmark, it is increasingly dangerous to walk the streets in some parts of town (such as the largely immigrant neighborhood of Nørrbro, just north of Copenhagen’s city center) wearing a yarmulke or any other outward sign of being Jewish. In that country of some 8,000 Jews living among 5.3 million, there are almost 300,000 Muslim immigrants from North African and Middle East countries. In neighboring Sweden, the hate against Jewish Swedes has already reached intolerable proportions and much of that country’s population has emigrated elsewhere. “The Jews of Malmö, a community of about 1,500 in a city of 300,000, are living through a new form of anti-Semitism,” one observer wrote in Tablet Magazine last year. This new type of Jew-hatred is a component of the waves of immigrants from the same countries that are settling in Denmark. Assaults on Jews in the streets to attacks of synagogues have led many Jewish Swedes to leave their centuries-old homes for Stockholm, Israel, or the United States, community leaders report. To the west in Norway, where the Jewish community numbers at fewer than 900 people, a 2012 study by the Center for Studies of Holocaust and Religious Minorities showed that 38 percent of Norwegians agree that Israel acts towards the Palestinians in the same way that Nazis acted toward the Jews. The previous year, an Oslo Municipality study revealed that 1/3 of all Jewish high school students are verbally or physically harassed at least two to three times per month. Anti-Semitic propensities (meaning who answered yes to 6+ of the Anti-Defamation League’s 11 index statements (see page 16 of this report) has risen by 3 percent from 2009 to 15 percent in 2011 in the United States. That may seem like a low level, but it is nearly one-fifth of the American population. That means that for every ten people, close to two of them harbor pernicious attitudes towards Jewish people. These troubling qualitative and quantitative measurements of the levels of hatred against Jews cover only Europe. I have not even begun to extrapolate conclusions from similar evidence in the Muslim world, where such hatred is more often than not bred into children from an early age in many societies in that large corner of the world. On the flip side, the economic boom happening throughout Latin America means that Jewish life in that part of the Southern Hemisphere is enjoying unprecedented growth and prosperity (with the large exception of Venezuela). What is known as the catch-up effect in economics has resulted in expert predictions that 2013-2020 will be a period of relatively “low-growth for industrialized economies while it will display dynamism in emerging economies,” the Economic Committee for Latin America and the Caribbean said. The Jewish Telegraphic Agency chronicles a surge in programs for Jewish youth in countries like Argentina; growth in the Jewish community at large in Panama; and the inauguration of a new synagogue in Sao Paulo, Brazil. In fact, there are so many students who want to study at the Aleph School in Sao Paulo that when they opened their doors last year, there were over 100 students on the waiting list. What an excellent and welcome forecast on an otherwise depressing subject, and something to look forward to for everyone who appreciates the growth of Jewish life.